Matter in the universe is not distributed randomly. Galaxies, quasars, and intergalactic gas outline a pattern that has been compared to soap bubbles - large voids surrounded by thin walls of galaxies, with dense galaxy clusters where walls intersect. One of the primary goals of the SDSS is to map this structure in great detail, out to large distances. Scientists have many theories about how the universe evolved, and the theories predict different large-scale structures for the universe. The SDSS's map may tell us which theories are right - or whether we will have to come up with entirely new ideas. Galaxies are usually found near each other, in galaxy clusters. The distribution of these clusters, and how this distribution evolves with time, are important tests of cosmological models: for instance, different cosmological models predict different numbers of galaxy clusters at different redshifts. Additionally, not only are galaxies clustered, but the clusters themselves are clustered! The degree to which both galaxies and clusters tend to group together is also a test of different theories. By studying the masses, distributions, and evolution of galaxy clusters, we can learn something about the formation of mass in the universe, a fundamental goal of cosmology. with an X-ray emission map superimposed. Because galaxy clusters can be very massive (up to 1014 times the mass of the Sun), their gravity is strong enough to hold on to extremely hot gas, with temperatures of millions of degrees. This gas emits radiation at X-ray wavelengths, which can be observed by X-ray satellites like Chandra, ROSAT, and XMM. These satellites have shown that a large fraction of clusters have structure and complicated internal motions, which indicate that they are still evolving. Also, satellite observations have shown that the X-ray emitting gas makes up the largest fraction of the visible mass in clusters, greater than the sum of all the galaxies. This is a very interesting result - remember that galaxy clusters were discovered as overdensities of galaxies, and now we know that galaxies are but a small part of the total mass of clusters. Some astronomers have even suggested clusters without galaxies may also exist - just huge clumps of gas. Galaxy clusters have huge mass, and the Theory of General Relativity says massive objects bend light as it passes by them, a phenomenon known as gravitational lensing. 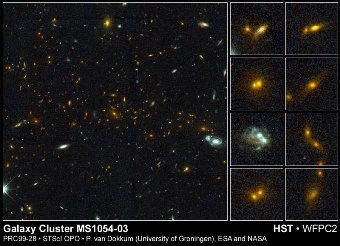 The amount of lensing caused by a galaxy cluster depends on the cluster's total mass, so by measuring the amount of lensing, we can weigh the clusters. These measurements can be compared to other mass estimates, like the amount of X-ray gas and the velocities of galaxies in the cluster. With these mass estimates, we can compute the mass-to-light (M/L) ratios for clusters. This ratio allows us to estimate the bias, which tells us how galaxies are distributed relative to the rest of the matter. The M/L ratios also help put constraints on the total mass in the universe. If we add up the mass of the galaxies that we can see, plus the mass of X-ray gas we have observed, and compare it to the total mass estimated for the cluster, we find that most of the matter is in some other form! This extra mass is called dark matter because it does not emit light. In fact, it turns out that most of the universe seems to be made of dark matter, which we can't see directly, but whose existence we can infer due to its gravity. Scientists have several theories about what dark matter could be, but no one knows for sure. The discovery of dark matter is one of the greatest and most intriguing discoveries of the last decade. number of old, red galaxies. Most elliptical and S0 galaxies are found in clusters, and more such galaxies are found in denser clusters. Amazingly, astronomers do not have good explanations for why most clusters contain elliptical galaxies. They also have a poor understanding of how galaxies in clusters evolve. We know that there are apparently more blue galaxies in clusters as we look back in time, suggesting that there used to be more star formation. 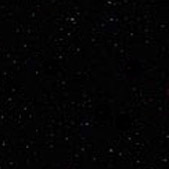 Yet, we also see clusters with significant numbers of old, red galaxies even at redshifts of about 1, when the universe was only a few billion years old. Using the SDSS, we will be able to study these the types and masses of galaxies in thousands of clusters, far more than have ever been studied before. Superclusters are simply clusters of galaxy clusters. Whereas clusters are typically found in the filaments and walls of the universe's "soap bubble," superclusters are at the intersections of the walls. Superclusters are the largest known structures in the universe, with some as large as 200,000,000 light-years! However, because these structures are very rare, only a few are known. The most famous superclusters are nearby, including the Great Wall and the Perseus-Pisces supercluster. There has been recent evidence for superclusters at redshifts of about 1, which places important constraints on structure formation and cosmological models. Additionally, the M/L ratios of superclusters are similar to those of clusters. This discovery implies that the mysterious dark matter cannot contribute more to the mass of the universe than it contributes to the mass of clusters. The image below shows the distribution of 10,853 galaxies in a small slice of the SDSS main survey, along with another 486 "luminous red galaxies", chosen to map out structure to higher redshifts. This sample constitutes only 1% of the expected final spectroscopic data! The bubble-like network of walls, filaments, and voids is clearly visible. The amount of space covered by the empty areas (voids) is different in different cosmological models; thus, accurate maps of the large-scale structure in the universe provide clues to the type of universe we live in. The distribution of galaxies in a slice of the SDSS spectroscopic survey.